The paper notes that “seminal work by Baumol (1967) underpinned the ‘classical view’ of the contribution of services to growth. This view was unambiguously negative, indicating that services were largely non-tradable and exhibited little scope for productivity improvements. But services have changed significantly since then and evidence today suggests that services are widely traded across borders (Loungani et al (2017)) and that, when services productivity is correctly measured, historical services productivity growth has been as strong as manufacturing (Young (2014)). Many studies confirm positive linkages between service sector liberalisation and economic growth. There are three aspects to this: direct benefits for the services sector, downstream benefits for production in other sectors which use services, and the potential distribution benefits from services growth.” Continue reading here. 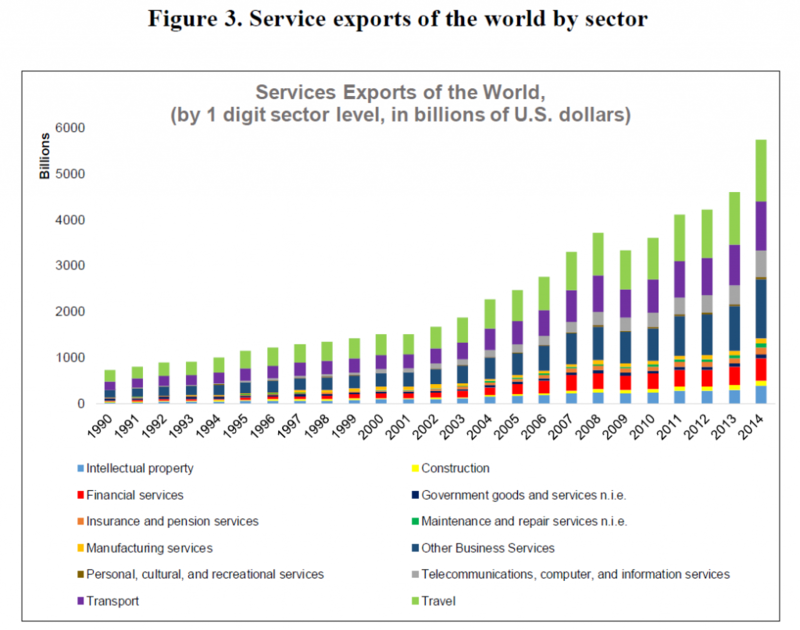 The Loungani et al paper and our new data set on services trade are available here. Source: Loungani et al (2017).